From a distance, the wind-sculpted landscape of Great Sand Dunes National Park and preserve can seem unassuming against the backdrop of the Sangre De Cristo Mountains in south central Colorado. As visitors get closer, the enormity of the sand dunes — the tallest in North America — comes into perspective. The 30 square miles of dunes are open for exploration. There are no marked hiking trails, so visitors must choose their own path and adventure. For the best vistas, ”High Dune” offers great views in all directions and is a two hour roundtrip from the main parking lot. The tallest dune in the park and in North America, Star Dune, is west of “High Dune” — a four-hour round-trip hike. Visitors can splash in Medano Creek, which flows seasonally throughout the year as snow melts off the mountains above. Other areas of the park offer great hiking and horseback riding opportunities. Several trails, such as the Montville Nature Trail and Mosca Pass Trail, venture into the forested areas of the park. Other trails lead hikers and backpackers up to the alpine tundra region of the park for some fantastic scenery and amazing overlooks of the dunes. At 13,297 feet, the summit of Mount Herard is destination for experienced hikers. Free backcountry permits are required to stay overnight at one of the several backcountry campsites. Great Sand Dunes National Park and Preserve is open year-round. The dunes are open 24 hours a day, and a free permit is required if you want to camp overnight on the dunes. There are 88 campsites in the Pinyon Flats Campground, some of which can accommodate RVs up to 35-feet long. Group sites are available as well. Be sure to make your reservations in advance if you plan to camp overnight in one of the campsites, especially during peak season. Weather in the park varies greatly with the season. The main parking and campground area is about 8200 feet above sea level. Visitors — especially those not used to the altitude — should be sure to drink plenty of water. The park’s altitude tops out at more than 13,000 feet in the alpine tundra of the Sangre de Cristo Mountains, where the weather will be much cooler. Around the visitor center and dunes, summer usually brings average daytime temperatures in the 70s and 80s. Visitors should be aware that during summer months, the sand temperature can reach up to 150 degrees Fahrenheit, so visiting earlier in the day is recommended. Spring weather varies greatly between warm days perfect for playing in Medano Creek to cold and snowy days with high winds. Fall is generally milder with warm days and chilly evenings. Winter brings temperatures down to well below freezing with chances of snowstorms. For more information, check out the park’s trail conditions, water status in Medano Creek, and the official visitor’s guide. Many other areas of interest reside just outside of Great Sand Dunes National Park and Preserve. Zapata Falls is a popular hike on public lands and boasts a beautiful waterfall and great views of the dunes from a distance.San Luis Lake State Park is a popular place for water recreation. The Alamosa National Wildlife Refuge andMonte Vista National Wildlife Refuge are nearby as well. Other unique and unexpected local attractions also tend to draw the attention of park visitors. With ecosystems ranging from dunes, to forests, to alpine lakes and tundra, Great Sand Dunes is an incredibly diverse park for plants and animals. The mountain and forest area of the preserve is home to several animals common throughout Colorado. Black bears can be found foraging in the shaded creeks and bighorn sheep roam the alpine tundra above the tree line. Mule deer are the most commonly seen animal in the park, but visitors can also occasionally encounter pronghorn (antelope) and elk in the surrounding grasslands. Smaller mammals found in the park include snowshoe hare, yellow-bellied marmots, beavers, water shrews, badgers and Abert’s squirrels. A diverse bird population includes peregrine falcon, mountain bluebirds and northern pygmy owls. Rio Grande Cutthroat Troutand other trout species can be found in Medano Creek. Tiger salamanders and a variety of lizards and snakes also call the park home. Historical artifacts place humans in and around the Great Sand Dunes as far back as 11,000 years ago. Nomadic hunter-gatherers followed herds of mammoth and prehistoric bison to San Luis Valley. Western explorers first entered the valley in the late 1600s, but the first written account of the dunes did not appear until 1807. From 1806 to 1807, United States Army Captain Zebulon Pike, Jr., led a government expedition to explore lands acquired as part of the Louisiana Purchase. Mistakenly off-course on his search for the headwaters of the Arkansas River, Pike and his men crossed over the Sangre de Cristo Mountains and descended into San Luis Valley near the dunes. In 1853, a gold rush brought prospectors to the valley in search of fortune. In 1932, the Volcanic Mining Company set up operations on Medano Creek, but the operation was soon abandoned. In 1932, President Herbert Hoover established Great Sand Dunes National Monument to preserve the dunes from destruction by mining or concrete-making activities. In 2000, President Bill Clinton signed the Great Sand Dunes National Park and Preserve Act; Congress officially designated the park and preserve on September 13, 2004, making it the nation’s most recent official national park. 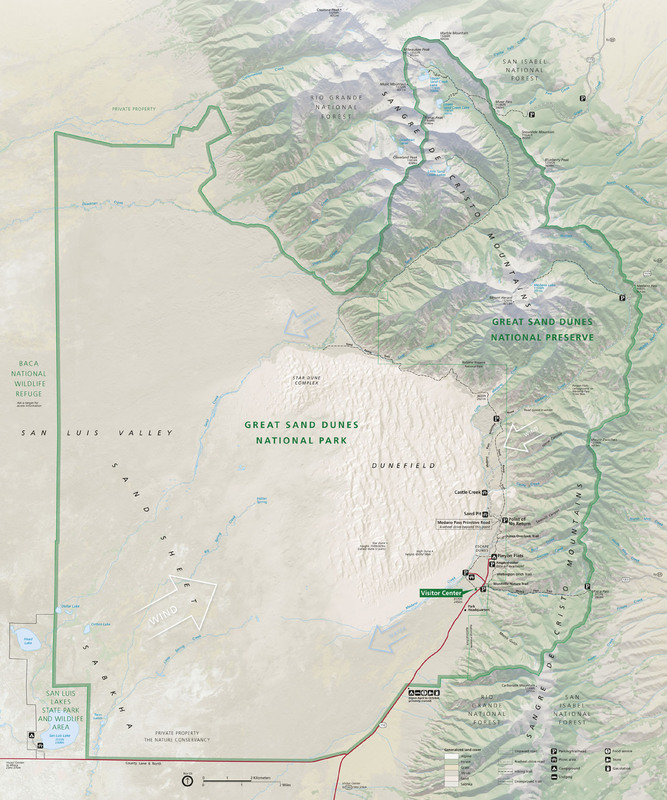 Click to see a detailed Great Sand Dunes National Park map.